I’ve had so many ideas to write about over the past few weeks, but it seems something is always distracting me. Today is a different day, though, and I thought I’d use that distraction and lack of focus and write about it. I was diagnosed with Adult ADHD back in 2011. Me, the one who has taught since 2002 and rolled my eyes at the many students who walked through my door with claims of being diagnosed either ADD or ADHD. I didn’t believe it was real. I brushed it off as parents who didn’t want to parent their children or children watching too much tv or playing too many video games. In my head, it was a made up issue that was too quickly medicated. Now, fast forward a few years (or more), and things for me have gotten worse. I was getting to where I got easily irritated and said things wondering why in the world I said them. I could barely carry on a decent conversation, and I would get frustrated and literally leave a conversation with a headache. So many things were going through my head and as the day progressed, it seemed to intensify. I would start one sentence but end with another one. People couldn’t follow what I was trying to say. I would forget where I was going in a conversation. I cried often at night because I couldn’t figure out what was wrong with me. I would get to work and see what all needed to be done, but I couldn’t figure out how to organize my thoughts or where to start, and I would spend forever making a to do list and then perfecting it. Before I knew it, the day was gone and all I had accomplished was making an immaculate list – or surfing the web. If someone added something to my workload, I would get so overwhelmed I would burst into tears. I didn’t know what was wrong with me. So many ideas flooded my mind daily, and I would start an awesome project and throw myself into it, but then I would lose interest and either not complete it or haphazardly finish. At some point I overheard someone talking about adult ADHD, and they were describing me to a T, but again I didn’t believe it existed. I pushed it in the back of my head, but it kept coming back for weeks, so I silently got online to take some tests just to see where I ranked. Sure enough I was way up there on 100% of the tests I took and decided to just go to the doctor and see. I spent an hour talking to my doc, and he concluded by saying, “We have kind of a checklist we look at to determine if you are ADD or ADHD, and you’ve pretty much hit everything on my checklist. You are a perfect example of someone with ADHD.” I wasn’t sure whether to cry because I didn’t want to hear that or cry because finally I had answers to why I was the way I was. Either way, I wanted to cry. Understand that almost everyone at some point can relate to some or all of the struggles an ADHD person has, but one truly cannot comprehend what it means to struggle with these 24 hours a day, 7 days a week, 365 days a year for all of the years of a lifetime. And for me, it only worsened as the years passed. I want to share with you a day in the life of me without the medicine I prayerfully considered before deciding to take it. This is actually my day today, but I would like to start from last night after returning home from my instructing at the gym. 8:50pm: Get home; exhausted and ready to go to sleep, but I’m extremely thirsty because I had a hard workout, and I grabbed something quick to eat on the way home but didn’t get anything to drink. I walk in the door and realize I still have a load of laundry to do. Start the washer and grab the small pile of kids’ laundry and put it in. I see the lunch boxes on the kitchen counter. Oh, I still have to get lunches ready for the kids tomorrow. My son wants hard boiled eggs, so I get those started. When I turn around, I see the dishes from dinner that need to be put in the dishwasher, but first I need to unload this dishwasher. As I start to open it, I remember I didn’t finish putting the laundry in the washer, and it’s already almost filled up with water. Run to my room and get the rest of the laundry, but I struggle to get it all in the washer because by now it’s full of water. I close the lid and go back to the dishes and realize I didn’t put the fabric softener ball in the washer. So I do that. Oh! I have a pile of clothes on my bed that has to be taken care of so I have a place to sleep tonight! I fold and hang the clothes up and hear something strange coming from the kitchen. The water is boiling over! I forgot I had those eggs going, so I turn the burner down and realize I still haven’t unloaded the dishwasher. Halfway through the unloading process, I realize how thirsty I still am, but I just want to finish the dishes first. 9:12pm: Oh, tomorrow is trash day! I need to gather up the trash and get it ready to go outside. I gather everything up and leave it in the back. I’ll take it out before I go to bed. I hear a song in my head and kind of dance to the music that only I can hear and realize how thirsty I still am. But I can’t forget the dishes. 9:15pm: Dishes are taken care of, and now I need to figure out what else to give the kids for lunch. I pack up the lunches and clear off the counters. I’m so tired, and that ridiculous song is stuck in my head. I can’t for the life of me figure out why it keeps playing over and over, so I replay the night (backward) to figure out when did I hear it. I realize I heard it on the radio when I left the gym. That was an hour ago! For some reason I decide to sit down for a few minutes. I keep thinking I need to bathe and get to bed because I’m so tired, and tomorrow is picture day for the kids, so I need to take some extra time fixing the little princess’ hair. That means I need to wake up earlier than usual. I remind myself (again) that I’m so thirsty, but I really don’t want to get up. 9:30pm: I have to take a bath. I have to go to sleep. I get up and do these things, but first I need to look at Facebook. Why? I don’t know, but I do. Why is that song still in my head?! I wash my face and then sit and stare blankly at the wall. There’s no telling how long I did that, but I know the hot water was no longer hot. This is something I do every time I bathe. I take forever because I daydream about nothing or about everything. I finally get soap and bathe myself (probably a total of 3 minutes despite the 20 or so I spent in there). 9:55pm: Brush my teeth. I’m so close to getting in the bed. It’s within reach. I just need to brush my teeth. While brushing my teeth, I catch that stupid song going through my head again, and I realize that I used to like it, but tonight I hate it so much. I don’t want to hear it anymore. Get out of my head Miley Cyrus! I daydream, as usual, while brushing my teeth, so that little task takes much longer than it should. I try to focus on finishing because once I do, I can finally get myself in the bed and close my eyes. I’m so sleepy! I focus so much that I picture the back of every single tooth and try to make extra sure I get them perfectly clean. 10:01pm: Seriously! I’m still brushing my teeth. Surely they’re clean. Now I can go to bed! I look in the mirror and realize I still have to take my eye makeup off, so I do that. 10:05pm: Finally I can get to bed. I start walking to the bed and realize I haven’t started the dishwasher, so I go toward the kitchen to start it. Halfway there I realize I still haven’t had a drink, and my empty cup from last night is on the table beside the bed, so I go back and get it. I start the dishwasher and pour my cup of water and fill up the water pitcher so I will be sure to have some in the morning. I realize I didn’t take the trash out, but I can do it in the morning on my way out. 10:10pm: Finally, I get to lay in my comfy bed. But before putting my phone on the charger, I decide I need to take a look at Instagram and Twitter and Facebook. When I do these things I am usually just staring at the screen and not even really looking at anything. It’s my security blanket. Instead of fidgeting I scroll on the screen. It’s somehow comforting to me. 11:00pm: TV goes off, and I decide it’s time to sleep. I check my alarm on my phone. I also check my volume and make sure the ringer is turned off. I’m an incredibly light sleeper. The slightest thing wakes me up, and once I’m up there’s no going back to sleep. I start to close my eyes and question if I really did look at my alarm. Was it really turned on? I need to check it again. Then I need to check the volume to see how loud it will be in the morning. Oh, and I need to double check that I put it on vibrate. I tend to do this 3 or 4 times before going to sleep. I close my eyes but a thought comes to my head, and they open with my heart pounding because I’m afraid I’ll forget this idea if I wait until morning, but I don’t want to get up and write it down. I close my eyes again. Just as I doze off they dart open again because I question whether or not the packets for school pictures were filled out since pictures are tomorrow. Thoughts like this happen several times before finally falling asleep. 6:00am: Alarm goes off, but I’m not ready to wake up. I don’t feel like I slept at all because that stupid song played in my head all night, and I dreamt I forgot to fix the princess’ hair for pictures, and both kids spilled chocolate milk all over their clothes on the way to school (even though we don’t have chocolate milk ever in our house, so that wouldn’t even be possible). I also dreamt I was oversleeping, so I woke up several times to check the clock. Did I sleep at all? I push snooze. 6:09am: Alarm goes off, but I’m not ready to get up. I open my phone and get on my bible app to find a verse to make as my theme for the day. My theme is to let God love me the way only he can do. Now, I need to check Instagram and Facebook. I also need to see what the temperature is. I get distracted because it tells me it will take me 13 minutes to get to work if I left at that moment. I figure out in my mind what time I need to leave by in order to get to work on time. Then, I turn my Kidd Kraddick app on, and I’m ready to get up. I sit in a daze watching the show and realize a lot of time has passed. We’re all going to be late! 6:40am: I brush my teeth and start getting ready. I realize I’m not 100% sure what I’m wearing today, so I stop putting on my makeup and go search in my closet. I find something that’s not wrinkled and go with it. 6:55am: I remind myself not to forget to take my medicine before I leave. Then, I remember I never actually took a drink of the water I poured last night. That must be why I’m so incredibly thirsty. 7:36am: I’m so going to be late to work (7:45 is what time duty starts for me). I race to get my bag and realize I left my water on the counter. Grab the water, and I’m ready to walk out the door, but before I get out I realize my keys are still in the bowl on the counter. I grab the keys and head out. I check and double check that I locked the door. When I get to my car I realize I never brought the trash out from the back. Oh well, it’ll have to wait until Saturday. When I back up, I question whether or not I locked my door, but I’m already late, so I have to leave. 8:24am: I just realized that I forgot to take my medicine! 8:50am: I need to make a to do list so I can stay on track since I forgot the medicine this morning. I spend at least an hour making and perfecting the list. 10:00am: I can’t get anything accomplished, so I decide to write this post about my day. Why? I have no idea, but it seems like a good idea even though I had other post ideas and a to do list that’s forever long. As the day progresses, other things call my name. I remember I need to make an advertisement for an upcoming event, and someone started talking to me about something not related to anything important, but I didn’t hesitate to carry on the conversation for several minutes. 2:32pm: I’m finishing this post. I did about 1/10 of what I had on my to do list, and I have 1 hour left to my work day. Where did this day go? Oh, I just realized I’ve been thirsty since lunch. I ate but didn’t drink anything. I believe I’ll do that right now. Maybe tomorrow I can focus and accomplish a few things on my list. I’m exhausted. If you made it to the end of this, then I can assure you ADHD is probably not something you face because more than likely you would have given up after the first paragraph or two. If you are reading this part, then God bless you because I know there is nothing here that’s beneficial to you. I apologize for “rambling,” but maybe there is someone out there who can relate. There are truly millions of things going through my head, and I’ve had to come back to this writing several times today because I’ve gotten so distracted. It’s real. I was wrong for thinking otherwise, and I hate hearing from siblings and others who tell me how not real ADHD is. I was that person. The reason they say that is because it’s not real to those who aren’t affected by it in some way. 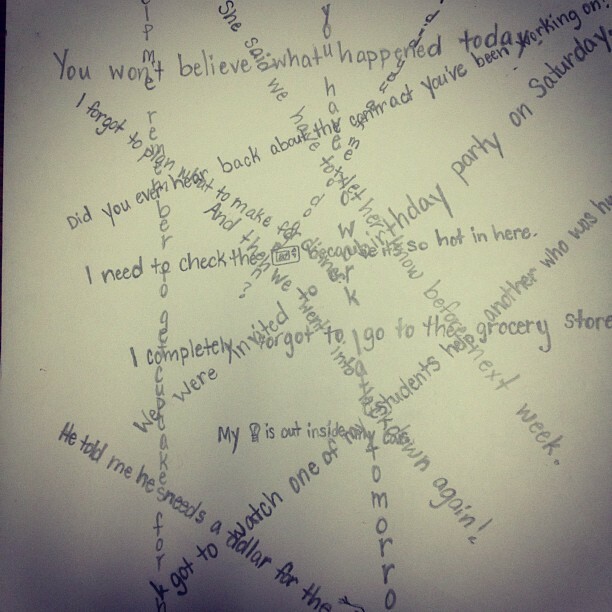 I thought something was wrong with me. I used to question if I was crazy (for lack of a better word). I’m not, though. God made me perfectly, and perfect for me means a brain that never stops and runs like a car powered by nitrous oxide. If you are a person who doesn’t believe what I deal with is real, I ask that you don’t voice that to those of us who know it is. I’m not saying this to be mean. I’m saying it because it’s a very difficult life, and for someone to tell us it’s made up, well, that just hurts. I can tell you this is very real for me, and I understand that you may not be able to relate to it or comprehend what it’s like, and I don’t expect you to. But I do hope you respect that it’s difficult to get through a day with expectations to function as if this isn’t an issue. And that’s what we do; we make it each day functioning as if we don’t deal with this because it’s something that’s simply not understood enough by those around us. The drawing above is something I did a year or so ago. I needed to get onto paper what it’s like in my head, and this was the only way I could do it. The way I describe this picture is that this is only 2 minutes in my brain. By the end of the day, though, this would be so full with words pouring off of the page and onto the floor, and I’m exhausted from trying to make it make sense. hahaha sorry but I find this funny because it is totally relatable. This post sounds like everyday of my life! I have been diagnosed with ADHD since 2008 and been learning to control what I like to call the slideshow of endless ideas. I can see that you struggle with the slideshow too. My best advice: Check-lists and sticky notes; I find them to be a lifesaver for when I thought comes up and I already have a ton to do. Great post. Thanks so much! I am a list person for sure. I have AwesomeNote on my phone, which is wonderful, but I’m a very tactile person and need to physically write my tasks and reminders, and I need to be able to touch them. I go through sticky notes like crazy! It’s a gift and a challenge all rolled into one. I agree, and I am certainly going to have to search for this AwsomeNote for my own phone! I find this totally true and relatable. Bless you Misty! I’ve had days like that, but could not imagine every day like that. 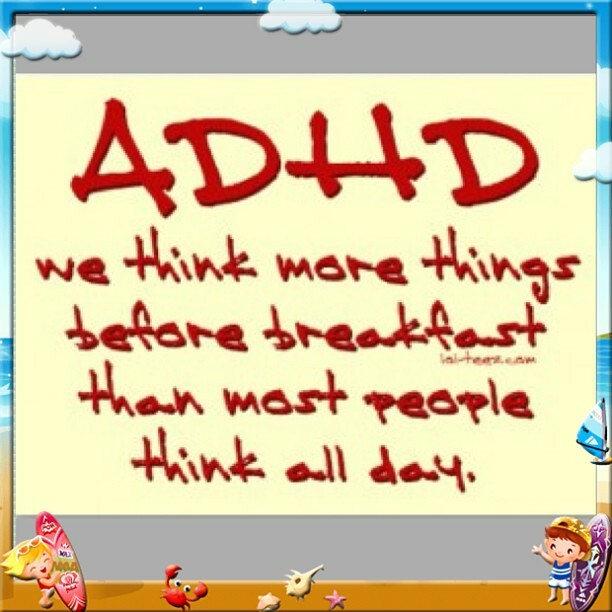 As a teacher, wife and caregiver of seriously ADHD people, I appreciate the insight. Praying you remember your meds and to drink more water tomorrow. Lol. I made it through the whole post Misty, but that’s because I took my 2nd dose of concerta a little late, so I’m still focused! Haha! I COMPLETELY relate to everything you described. I’ve lived it for years. I was diagnosed not long after you were. Some days I think, “These meds don’t work. I probably don’t need medicine.I must be making this up.” Then, like you, I’ll occasionally forget to take it and I’m hit with the realization that “Yes….I need the medicine.” Thanks for being transparent. Others who don’t deal with this can’t imagine what it’s like. Btw, on the subject of lists and notes, I keep a spiral notebook with me most of the time to jot things down as they come so I don’t forget. I have to touch my list too. Its amazing how manageable things seem when you write it down.